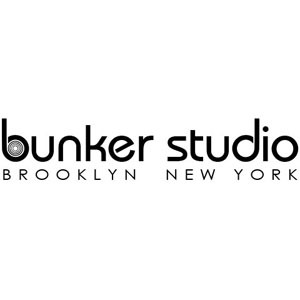 The Bunker Studio in Brooklyn was established in 2006 and the new location opened November 2011 and designed by Rod Gervais. Studio A easily allows for live tracking of large ensembles with excellent sight lines and isolation. The huge live room with 25′ ceilings, string and rhythm rooms and iso booth each have their own unique character and provide inspiring acoustic spaces in which to play. Rock bands, jazz ensembles, big bands and chamber groups have all taken advantage of the uniquely flexible layout and acoustics. The instrument selection is extensive with a 1896 Steinway C Grand Piano, Hammond C2 Organ, Fender Rhodes, Wurlitzer, MiniMoog, Oktave KAT, Yamaha CS-5, Roland RS-09, EMU Emulator rounding out the keyboards. Fender, Gibson, Aguilar and Ampeg guitar/bass amps. Ludwig, Slingerland, Premier and Sonor drum kits and snares. Plenty of Mytek Private Q headphone stations so the band can make their own mixes and plus a plethora of music stands and sharp pencils. The control room features a 48 channel vintage Neve 8088 mixing console plus an extensive selection of outboard equipment. Vintage and new outboard includes Teletronix LA-2A, Gates Sta-Level, Retro 176, UA 1176's, 1178, LA4's, Federal AM-864's, Neve 33609, API 525, 550, 560, Daking Fet3 and Fet, etc. Effects include two EMT 140 plates, Echoplate Plate Reverb, Bricasti M7, Lexicon 200, Eventide H3000, Lexicon PCM41, Roland Space Echo and DC30. In addition to the 48 Neve 31102, API 512 outboard pres we also have 8 channels of Abbey Road style custom REDD47 tube mic pres the are unique to The Bunker. It's an extremely accurate monitoring environment which enables confident decision making whilst tracking and mixing.